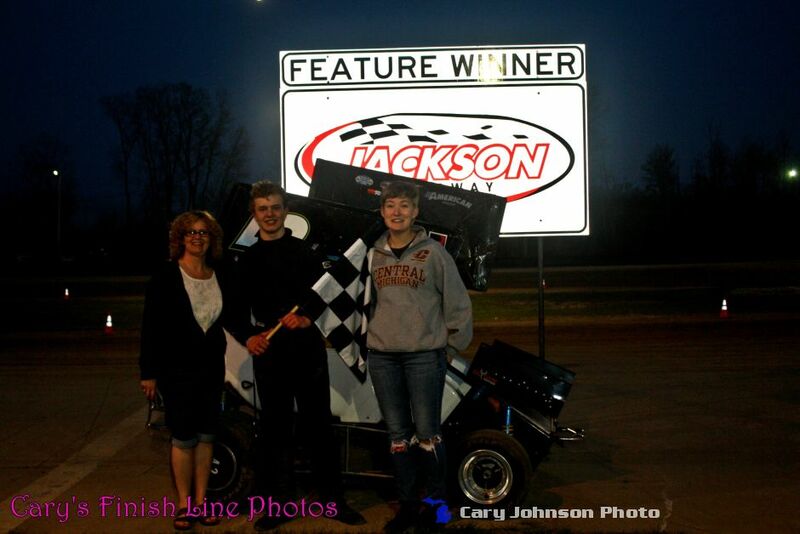 Jackson, MI — (May 16, 2015) — It was a perfect night for some dirt racing as the Mini Sprints of Jackson Speedway made their way to the track for their first points race of the season. The kid sprints hit the track first, and it was Dylan Canine leading flag to flag to capture his second win of the season. He would like to thank his sponsors Auto Images and K9 Rod and Cycle. He would also like to thank his Mom, Dad and Grandma. Up next, the 600 Open Winged division took the green, with the 42 of Boston Mead and the 48 of Zachary Jackson making up the front row. Mead would take the lead, with Jackson dropping to second and Mark Yearling and Cody Tyler battled for the third position. Mead pulled away by a full straightaway before the caution came out for Yearling as his engine went up in smoke going down the front stretch. When the green flag was displayed, it was once again Mead taking the point. As he began to pull away, Toby Tyler and Cody Tyler would begin to battle for the third position, with the eldest brother taking the position. 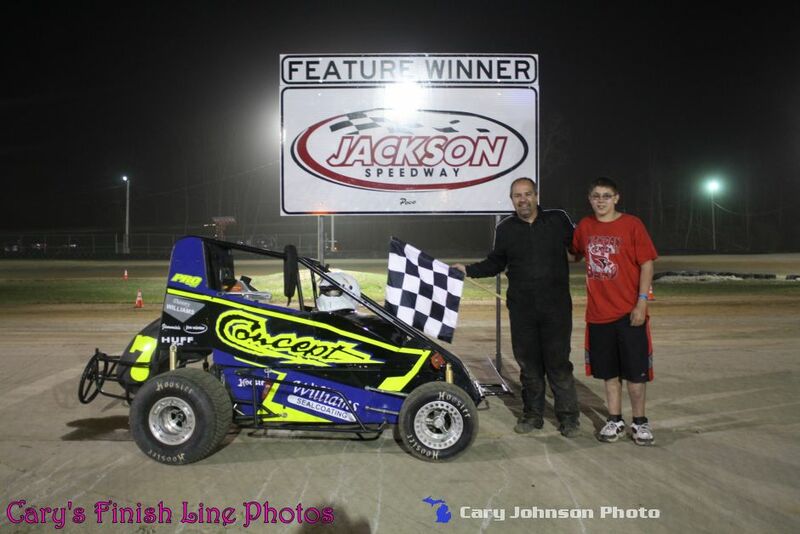 When the checkered flag waved, it was Mead taking the win, followed by Jackson, Cody Tyler and Toby Tyler. Boston would like to thank his sponsors OSR Engines and Irish Hills Collision. He would also like to thank Roger Sadowsky. Carl Peterson and Andrew Church made up the front row of the 600 Sportsman feature. Paterson would take the lead, but Church stayed right with him and tried to take the position. He was unable to make it stick, and this allowed Tyler Hershberger to get into the mix and fight for the position as well. The caution flew as the 57 of Robert Pell spun, doubling the field up for a restart. When the green was shown again, the 91 of Hershberger dove under the leader and was able to make the pass stick. Church and Peterson drag raced down the backstretch, fighting for position. Church would come out on top, but then clipped a tire in the turn and spun, bringing out the yellow. The field bunched up once again, with Hershberger and Peterson leading them to the green flag. Garrett Rons moved into the mix and tried to battle Peterson for the second position, but was unable to make the pass. Church moved back into the battle for position and Peterson and Rons tangled in the turn, bringing out the caution and giving the position to Church. The field lined up single file coming to the green one final time, with Hershberger and Church pulling away from the rest of the pack. Peterson attempted to dive under the 22 of Justin Kyser, but could not make the pass. When the checkered flag flew, it was Hershberger, followed by Church, Kyser, Peterson and Rons. Tyler would like to thank his sponsors Rupp Seeds, Pettisville Grain Company, Complete Wireless Solutions, Emory Hershberger Trucking, Marie Hershberger Cosmotologist, Rychener Speed and Fab and Rodney Stealy and Brad Nichols at Concept Chassis. He would also like to thank his mom, dad, sisters, brother, Brandon Oyer, JR Hunt, and the Lord. Next on the track would be the 250 Ninja class, with Carter Hodges and Brianna Sloan leading the field to green. After a few bad attempted starts, the field lined up single file with Hodges on point. He would hold the lead as the 91 of Travis Parkhust moved past Sloan. The duo would battle for the second position as Hodges pulled more than a straightaway ahead of them. Hodges took the checkered flag for the second time this season, followed by Parkhurst and Sloan. Carter would like to thank his sponsor Hodges Body Shop. He would also like to thank his Papa, Nene, Dad and Jenny. The 600 Restricted took the track next with Nolan Monroe and Keith Sheffer II making up the front row. Monroe took the lead and the field began to spread out. Monroe held a comfortable lead until the 22 of Shasta Keriger spun in front of the field, bringing out the caution. Monroe would retain his lead and begin to pull away again. The 23 of Mackenzie Yeo-Brown moved in on Sheffer and tried to make a pass for second, but was unable to make it stick. Monroe took the win, followed by Sheffer, Yeo-Brown, Lane Kellogg and Kreiger. Nolan would like to thank his sponsor American Wall Systems. He would also like to thank his parents and Randy Mathews. The 600 Open Non-Wing class took the track for the final event of the evening, with the 17 of Derek Donaldson and 14 of Andrew Church making up the front row. Donaldson would take the lead, but the 9 of Garrett Rons dove under him and was able to make the pass for the lead. The caution flew when the 33 of Mike Pustay spun coming out of turn 4, doubling the field up for the restart. Rons would jump back into the lead, with Donaldson looking under him to make the pass, but he was unable to make it work. Tyler Hershberger moved in on Donaldson and the duo battled side by side for the second position, but the caution would fly once again, allowing Donaldson to keep the spot. When the green was displayed again, Rons would hold the top spot and Hershberger and Keith Sheffer I would both slide under Donaldson taking over the second and third positions. Hershberger moved in to challenge for the lead and the top 4 cars ran nose to tail, each vying for a better position. As the cars came around to take the checkered flag, Hershberger tried to dive under Rons as Donaldson tried to move under Sheffer for position. Hershberger tagged the leader, causing him to spin and collect Donaldson as well. Rons would go on to take the win, followed by Sheffer I, Brad Underwood, Church and Hershberger. Garrett would like to thank his sponsors VFW Livonia Post 3941, Anatomical Resources and Joes Headquarters. He would also like to thank his family. Please join us next Saturday night for another exciting night of racing at the new Jackson Speedway! Pit passes are $15 for all ages; General Admission is $5 and kids 12 and under are FREE! Hot laps begin at 5:30 and Racing begins at 7:00.